I use open source code every day. Be it Rails or the myriad of Ruby gems out there, open source is part of my life and work. To show gratitude to those who volunteered thousand of developing hours to these projects, I often search ways in which I can contribute to them too. Until recently I simply didn’t know how my contribution could be meaningful. But I may have found a simple but effective way to contribute to open source projects. It all started when I used the MetaInspector gem in one of my projects. After using it, I thought about the amount of time it saved me in developing a url scraping feature I had to do. So I decided to check the gem repo to see if I could add anything to it. I had a look at the issues, looked at the documentation, forked the repo and ran the tests. It was when I noticed that that was some deprecation warnings showing in RSpec. 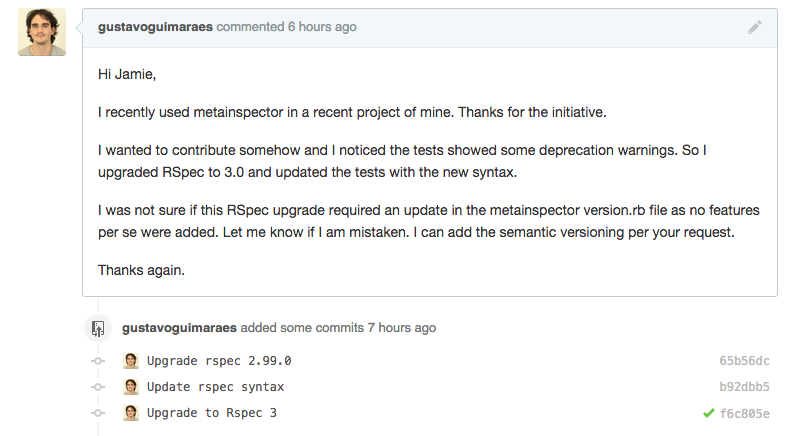 The most recent RSpec is 3.0 so I saw a chance there to update Rspec and to include the new RSpec syntax in the gem tests. Once I updated the tests, I submitted a pull request and added my comments. Jaime Iniesta, the maintainer of the gem, replied to me within minutes. I was exhilarated! A simple but relevant contribution was well on its way. I made the modification he suggested and again within minutes I received a feedback. My own small but meaningful contribution to an open source project. It made me feel great that day! This experience also made me realize that contribution can be something such as updating tests in gem, adding some CSS to redesign a gem website or write documentation. I hope this post inspires you to contribute something simple but effective in its own way.